The sisters walk in sync for the single off of their upcoming album. 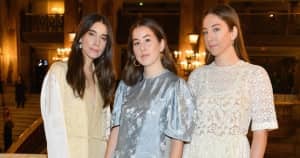 HAIM, who are releasing their sophomore album on July 7, have dropped the video for the single "Want You Back." The video features the sisters taking on empty streets in the early morning, strutting and dancing that way through synchronized choreography. The trio recently released the song "Little Of Your Love," which will also be featured on the upcoming album, Something To Tell You. HAIM performed both singles on Saturday Night Live last month. Watch the video for "Want You Back" above, and preorder the album here.